Hi All, Firstly to those who read Tactical Movement thank you and thank you for the great feedback also. I have written this as post publishing Tactical Movement as some interesting thoughts came up and I wanted to share this mind field with you all. Enjoy! I am sure that many coaches have done some variation of the “defend, attack and rally” drill and the purpose of this is not to dispel its use but to offer some thoughts as to ways to make the best out of it. I have used this exercise from a player perspective, i.e. the player who is choosing to rally, attack or defend and also where from the opponent perspective where the player considers what his/her opponent is doing. With young players the wording and their connotations have caused me a few issues along the way. The word attack is the primary offender as to very young players they associate this with ball speed. Attacking tennis must be played hitting the ball faster, and in many cases causing errors and quite drastic ones at that after all the work they have put in to create this “attacking” opportunity. Similarly defending is considered to be slower than rally and that rally is medium, again all related to ball speed. Rally by definition is a ball that keeps the opponent in a neutral position, ideally preventing “attacking” options and also not requiring any defensive mechanisms. This suggests that two players can rally from neutral positions and that the ability to rally from many positions on the court, providing they maintain the opponent neutral is also rally. As the competency of rally grows we end up with professional players rallying at extremely high levels which can be perceived as attacking play but really it is rally, just they are good at it. With younger players there is obviously a wider rally potential and that the match up of players where one player rallies the other defends or a rally ball from one player is seen as an opportunity to attack, meaning that they are not rally balls at all. This leads me to thinking that the desire for high quality rally balls is of great importance and not from single position but from all over the court (to include rallying on the move). Tennis is really a game of time and space and controlling both parameters. These two parameters appear in varying situations. Hitting into a space causes the opponent to have to manage a distance (space) in a certain amount of time. If the space and time is managed well by effective reaction, court coverage and selected footwork then the player will be able to execute an effective shot maintaining rally. If not then the player must adopt defensive techniques in order to solve the problem of lack of space and time. The player must be able to create suitable time to recover. Depending on the management of space and time the player will be able to exploit the space and time of the opponent who will have to manage their space and time to counter. A player will be comfortable rallying in certain situations and at a certain level and will also have a programmed view on when it is possible to attack and similarly when to defend. However, player’s choices of these may be contrary to our views. A player may choose to defend when in fact they could rally and hit a more effective shot given that they had or could have the physical and technical competencies to support this new tactical desire. There are times in a game where a player will utilise varying ball speeds, spins, flights etc in order to manage their space and time and also to have some impact on the opponent’s space and time. All degrees of these can be used in any of the three situations although some will be more desirable than others. This is where pre conceived understanding of rally, attack and defend can cause problems. In essence a player will resort to defending when they feel it is necessary and similarly attack. It is worth considering whether when a player resorts to defence the player could rally and that surely the player would want to rally before defend where possible. Also in considering attacking there are more options than just increasing ball speed. 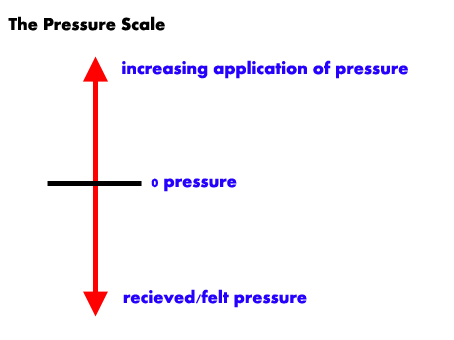 I have thought about using a pressure scale as opposed to Attack, Rally, and Defend in order to encompass more options within play. In an ideal rally situation both players are 50/50 in pressure and arguably at zero pressure (or the centre of the scale). A player can apply a pressure in numerous ways by exploiting the opponent’s space and time using a variety of ball speeds, spin, flight, direction etc. In any instance a certain amount of pressure is applied to the opponent (simply because they now have to deal with and execute their tactics). In rally the opponent’s goal is to play a shot that keeps the opponent neutral and hence brings their pressure back to 0. The opponent will want to manage the space and time by covering court efficiently and within the given time frame created by the oncoming ball, apply a footwork pattern to firstly execute and secondly allow recovery, play a shot that allows appropriate recovery and cover the said court again efficiently. Both players have fluctuated up and down the pressure by applying and feeling pressure. There has been no need to defend and no player has been able to attack? Simply pressure has been applied and managed. Through the application and management of pressure which links seamlessly to the management of space and time which is underpinned by effective tactical movement players can understand how they can control points. Points are constructed by searching for ways to increase the application of pressure. When serving, there is chance for the server to apply pressure from the outset. The returner aims to neutralise and the players will be somewhere on the pressure scale post these shots. When both players are at the back of the court players will look to construct a point by testing the opponent’s space and time and when appropriate apply more pressure. This could be through repeated shots to a weakness, playing the ball side to side, injecting pace, using angles and a whole lot more. This suggests an overwhelming importance to consider rallying in a wider context and also to consider the other 2 situations (attack and defend) in more holistic way. For example a player may finish the point with a drop shot having constructed the point through consistent rallying exploiting space and time. There is of course a variety of quality in play from mini tennis through to professional levels and therefore there becomes a quality factor that at all levels must be considered. Andy Murray’s rally ball is of a much greater quality than mine and within that match (if it were to happen) I would find it difficult (maybe impossible) to rally and apply pressure against him. Similarly my rally ball will affect certain players in the same way. The qualify factor dictates that a player can manage the space and time well enough to execute a stroke that manages the pressure and applies a certain required pressure to the opponent. If two players are rallying but one can maintain a higher tempo than the other, the player with the lower tempo or lack of sustainability at the higher tempo, will break first through error or opportunities to apply pressure. I am sure we have all seen a player who can get to ever ball and get it back with seemingly low quality but the other player makes the error first. There could be a few reasons for this. The player with the lower quality shot is managing their time and space well, although presenting opportunity for the opponent to apply pressure. The opponent sees this opportunity but tries to apply pressure through pace and continually increases this pace until the error appears. This, I would consider, to not be very smart play. The player has neglected rally and assumed the old meaning of attack, instead of applying more and more pressure through direction, controlled pace and spin etc where undoubtedly the opponent would be forced to strive for higher quality or alter tactics. A player will want to be able to inject pace into the ball in order to reduce time for the opponent and there is a time and a place for this as is there for any other shot. It is the point of the shot and the way the space and time is managed that will affect the outcome. My limitation model suggests that the 4 performance factors (technical, tactical, physical, mental) each limit one another, the tactical factor being the one that provides purpose for the others. Taking the rally concept the tactical outcome would be to be able to rally over increased distances and in varying court positions under certain degrees of pressure. To what degree can the player do this? What techniques are working and which could do with some help? Is the player covering the court? Is the footwork choice appropriate? Does the player recover effectively and to an optimal position? Does the stroke keep the opponent neutral and apply sufficient pressure? Although there is a racket requirement to handle to sending of the ball there is also a heavy movement and footwork requirement which precedes it. In order to rally in such a wide context a player will need a host of physical ability including applying certain movement techniques and footwork patterns to achieve the tactic. If players are doing this well then the racket skill can be optimised. Ideally it is all done in conjunction at the same time. Considering this in a holistic manner to include the 4 performance factors players will understand what it is they are trying to do and also understand the progressions that you employ as a coach to improve certain areas within the whole game. This idea can be worked on within mini tennis red, orange and green and of course full ball. The idea being that if a player can rally from behind the baseline with a sponge ball can the player rally on the move? Can the player manage the space and time on the red court? Can the player use a variety of shots to manage pressure and apply pressure? I believe that a player in mini red can do these things and that this is what will effectively allow players to reach high levels. If a player struggles to manage space and time on the red court how can you justify moving to orange? This last part on mini tennis is to put the logic of keeping children in the stages for as long as possible in order to fully develop the skill set and understanding of the wider game. It is possible for a player to be behind the baseline, using a variety of shots to play the game, managing space and time and looking for ways to exploit space and time of the opponent. I made my kids count the number of times they missed when screaming Attack and trying to take the cover of the ball, rally, defend, attack is a great drill but unless the coach pays attention and provides more information it can become meaningless. Great article Mike and I’m sure you won’t mind me stealing a few little nuggets from it, keep up the good work. I like your thought process. I have never liked the “attack” part either. I talk to my players about looking for a ball to create with not to attack. It kind of goes along your lines of hitting a ball to put pressure on. Good stuff. I am liking your blog.